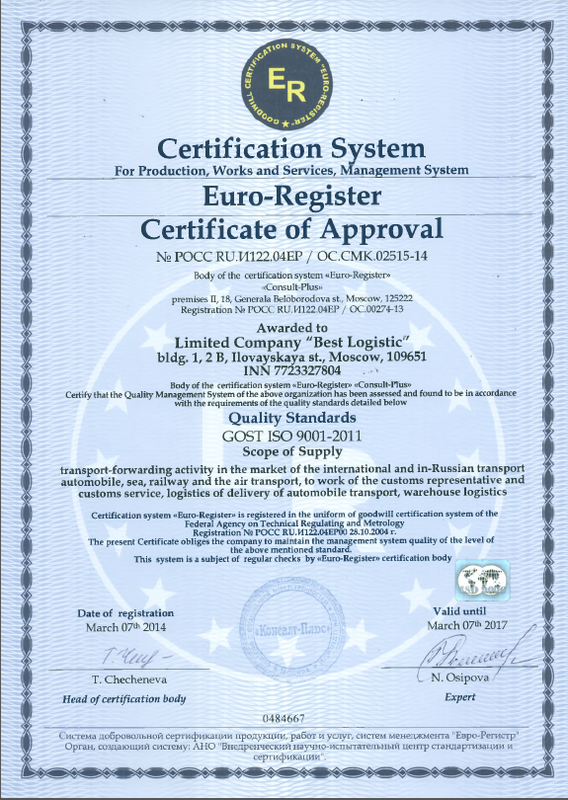 The “Best Logistic” Company is a Russian logistics operator which has been functioning successfully on the market of transport-forwarding and customs services since 2003. Our ultimate goal is to ensure unhampered movement of freight traffic for our customers in shortest possible time, with minimus financial and labor cost due to well-organized operating principle of our employees in the field of transportation and customs clearance of goods. Our main advantage is a comprehensive approach to organization of the entire logistics process from loading to delivery of goods to the final recipient. We believe, this is an effective management system of material, informational and financial flows, an interaction with producer and recipient. An integrated approach to logistics processes helps minimize risks in the process of delivery and customs clearance of goods. Company’s high level of management is confirmed by certificates of quality "ISO 9001: 2011". 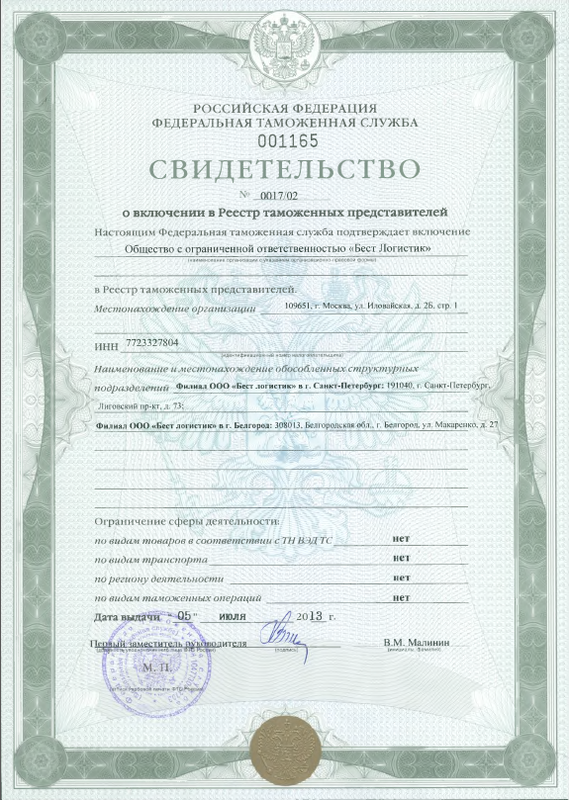 LLC "Best Logistics" has a certificate on including in the customs brokers register of the Russian Federation since 2003 and in accordance with the Customs legislation of the Customs Union carries out all types of customs operations that are requested by our customers. At customs clearance we rely on our staff only. However, partnership with major logistics operators gives us more possibilities to provide a full range of services for delivery and customs clearance to our customers. This way we can quickly adapt to the already existing logistics and develop new logistics projects as to meet customers’ needs. Truck fleet SC «Intertransexpedition» conducted by The “Best Logistic” Company allows uninterrupted truck provision in the required quantity and at the right time. There are offices in St. Petersburg and Smolensk on the territory of the Russian Federation. The company headquartered in Moscow. Foreign representative office in Germany (Best Logistic-ITE GmbH) has modern consolidation and handling of goods warehouses in Osnabrück and Braunschweig. We realize that nowadays key points that help operate in logistics successfully are: new approaches to work organization process, increased demands on the services’ quality and a full complex of works to comply with users' demand.